There is a religious base in the area, which brings inspiration, morality and ethics to people of all ages and faiths. Jasper traces its spiritual beginnings back to when the city was founded. Generation after generation, faith was the core that provided courage and confidence through hardships and good times. Some of the earliest settlers, who were German Catholics, built the cathedral-style St. Joseph Church over 130 years ago. 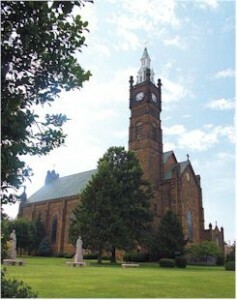 Today, St. Joseph Church is on the National Registry of Historic Places and is known throughout the state. As Jasper grew throughout the years, many other denominations became part of this spiritual community. Many extraordinary churches with unique bell towers, lavish parish centers, and one-of-a-kind architecture are proof of the dedication of spirit and importance of religion to Jasper residents. Holy Family Church has the second largest stained glass windows in America and Trinity United Church of Christ has a unique octagon tower of glass. Shiloh United Methodist, Christian Church of Jasper and Jehovah’s Witnesses churches encompass massive buildings to facilitate large congregations and events. The cooperation between the area churches is unique and shows the open-arm acceptance and respect for the many faiths of Jasper.